This bestselling title, fully updated to match the latest Cambridge IGCSE and O Level syllabuses. Used and loved by teachers and students around the world, engage students with full colour pages, the latest statistics and examples and case studies from across the globe. Packed full of engaging activities and revision questions, the book is now supported with online access to interactive multiple-choice questions, a full glossary of terms, revision questions and extrapractice papers, as well as answers to all the questions in the book. 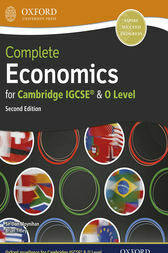 The accompanying Complete Economics for Cambridge IGCSE & O level Teacher Resource Kit provides teaching support that is easily customisable in print and digital format.